With hindsight, my 7 January blog on the decline in Common Knowledge felt like an introduction to this topic. 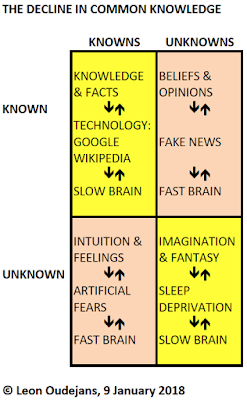 Subsequently, I realised there is an interesting link with the 4 components of human intelligence: Knowledge (known knowns), Beliefs (known unknowns), Intuition (unknown knowns), and Imagination (unknown unknowns). My diagram below outlines this relationship. Knowledge & Facts, including Common Knowledge, are under increasing pressure from Technology (eg, the internet), search engines (eg, Google), and online libraries (eg, Wikipedia). The essence is this: Why bother remembering facts if you can look for it whenever you need it? Our Beliefs & Opinions are under attack by a continued stream of Fake News (my blog). 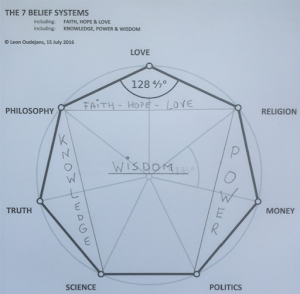 Our Intuition & Feelings are fed by artificial fears as human fears are an excellent manipulator for certain types of leaders (my 2015 blog, 2017 blog). A continued lack of sleep (a.k.a. sleep deprivation) has a "deleterious effect on the brain" (BigThink). 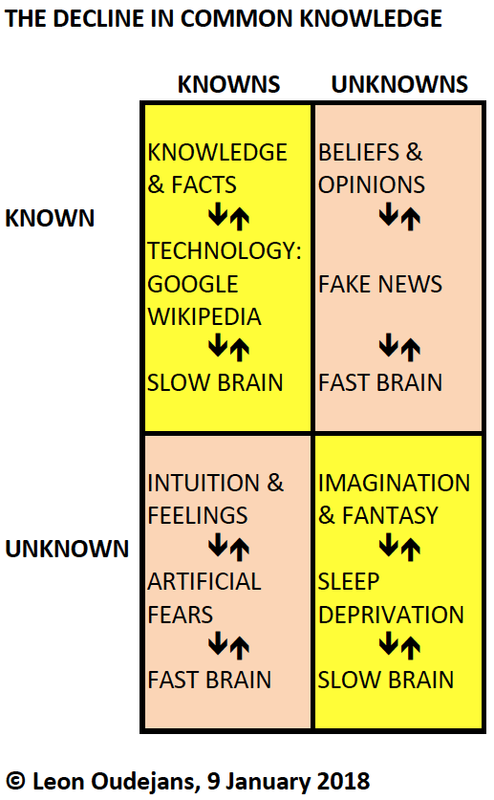 In today's society, all 4 components of human intelligence are under attack: the yellow components are shrinking while the orange components are inflating. There also seems to be an uncanny relationship with the 2011 NYT best-selling book Thinking Fast and Slow by Nobel laureate Daniel Kahneman. The yellow areas seem to fit the Slow brain while the orange areas seem to fit the Fast brain. Wiki: "System 1 is fast, instinctive and emotional; System 2 is slower, more deliberative, and more logical". It's also tempting to make a link to the Strauss-Howe Generational Theory (my blog) and "its four-stage cycle of social or mood eras which they call "turnings". The turnings include: "The High", "The Awakening", "The Unraveling" and "The Crisis" (Wiki). I think, feel and believe that a decline in Common Knowledge fits the 3rd Strauss-Howe turn: "the mood of this era they say is in many ways the opposite of a High: Institutions are weak and distrusted, while individualism is strong and flourishing" (Wiki).